I recently wrote about Killing Your Board - inviting groups to get over board of directors worship and get on with the actual mission of their organizations. Last week, APLN Seattle and Modus Cooperandi hosted the APLN Leadership Summit in Seattle. It was great! It was a fantastic success! It was, seriously, one of the best conferences I've ever been associated with. We had great discussions, people got a lot out of it, we removed it from the speaker-focused world of conferences and moved it into the participatory world of open-space. The conversations were deep, detailed and people left smarter than when they entered. 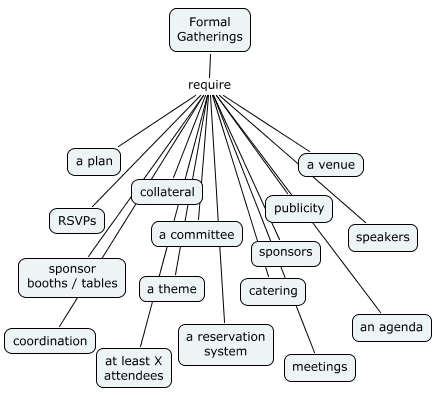 Here is why: Conferences (even good ones) involve massive overhead that burns out the most dedicated participants and ultimately harm volunteer organizations. Informal gatherings can achieve the same benefits with a tiny tiny tiny fraction of the overhead. Which do you think has less overhead? And, why does this work now and didn't work before? Because Informal gatherings are energizing points for conversations. Regular thematic face to face meetings in pubs and coffee shops provide very necessary social stimulus to conversations that can then move to the digital realm. Wikis, blogs, e-mail, tagging can all be employed to leverage live conversations. Consider that a weekly meeting about anything will attract only a subsection of the people available and you get another key and perhaps unappreciated benefit. Loudmouths don't always show up. After a while, everyone gets to participate, to cross-pollinate. 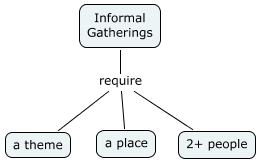 Next, informal gatherings allow topics to move with popular demand and remain extremely current. Waiting 6 months for the next conference won't do any more. People want to talk about things today. 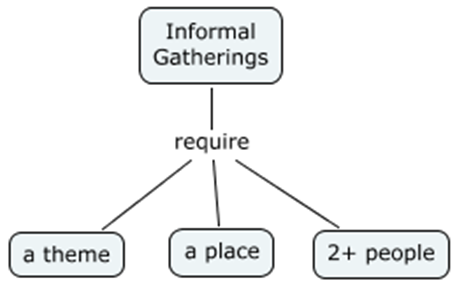 Regular informal meetings may make it easier to skip some meetings, but they also remove the problems of having to make a specific one as well. You no longer have to schedule out a week of your time to fly somewhere and meet with a bunch of people. Plus, if these are going on everywhere - you can meet with people in a given area simply because you are in town. What does an organization do in a world where they aren't worshipped as the conference promoter? They focus on actually being an organization. The organization can set the culture. They base activities on their mission. They define the groups infrastructure. For culture, the organization promotes the recording of the good ideas discussed at the informal gatherings, they encourage their members to network, they promote the advancement of the state-of-the-art. This is what every organization is supposed to do. They base this culture on their mission. Some missions will be very specific, some more broad. Some missions call for direct action (fundraising, evangelism, moonwalking, whatever). The events will need to reflect this. Infrastructure is also what is needed for the group. A group whose mission is to create the world's most active softball league is going to have different infrastructure than a group promoting Intelligent Transportation Systems. 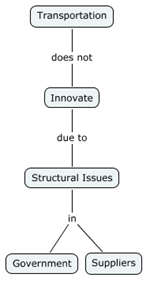 Defining and realizing appropriate infrastructure is a requirement for an organization. In a few weeks, there is a major conference in Toronto that will attract many people I'd like to meet. I am expected to pay over $2,000 just to attend, then travel, lodging, food, etc. While meeting up with all these people was a great opportunity, I was unclear why I had to pay the organizers that much money for it. How many people would I not meet because the cost was prohibitive. In the end I decided not to attend and promote the idea that such gatherings are beneficial. I'll go to the informal gatherings where the conversations are deeper and the pace slower. Maybe this is part of Slow Community? 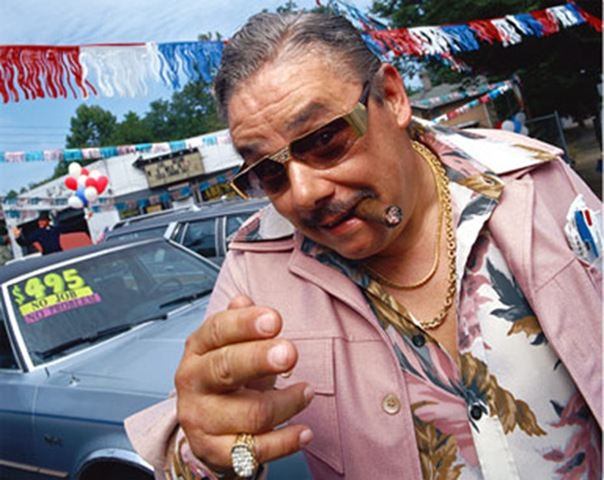 Someone once asked me, "Sure, I get that there's a niche in the market, but is there a market in the niche?" Eight years ago, William Rowden and I started Gray Hill Solutions to create innovative software for the transportation management sector. In the end, we were about as successful as we could be. So I'm going to tell this story based on my perception of this particular vertical. I believe the lessons here translate out to all verticals. Every vertical has blind spots, cultural issues, and built-in waste. It seemed like Gray Hill couldn't miss. 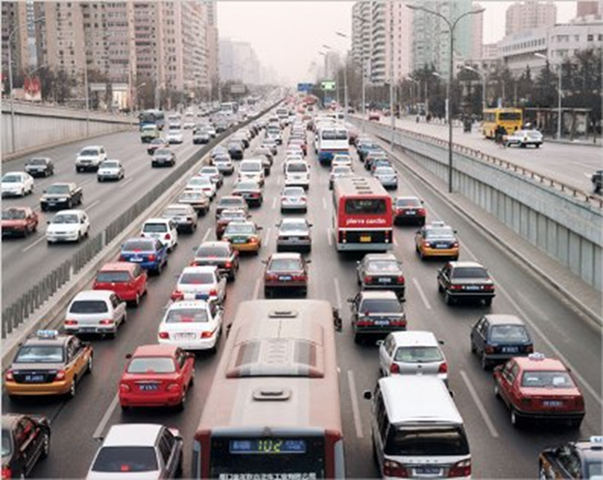 There is an entire industry called "Intelligent Transportation Systems" (ITS), but there are very few innovations in the product lines year to year. The industry was certainly large enough to support a niche player like Gray Hill. The actual technologies of ITS at the time were lagging the rest of the tech community by about five years. That led to easy identification of high-value innovation (or at least technical application) for the industry. Now, the industry lags behind by about 9 years and is only slipping further and further back. 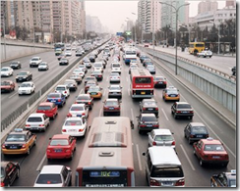 What is killing innovation in transportation? Why aren't obviously superior solutions being installed? Why do suppliers continue to make minor improvements on feature-poor products, rather than truly innovate? Last year I had the good fortune to be a panel member for a panel on data visualization at the Transportation Research Board's conference on Performance Measures in Newport Beach, California. When our panel talked internally, we all agreed we were there to collaborate on the state of the art in Performance Measurement for government transportation management. We were taking the "research" in Transportation Research Board seriously. So, even though my presentation showed elements of upcoming products by my company - it never mentioned a product or my company by name. We merely talked about strategies for the visualization of complex data. A vindication of this came during the morning plenary session on the second day. One of the speakers, a gentleman from the company Traffic.com, got up and gave a 30 minute speech about how great his company was and pitched their products. This was in a session called Data / Tools. It was not called Pitch / Woo. After about 10 minutes of this, I excused myself and left the room. I felt sort of guilty about it, but I just couldn't stand hearing a half hour commercial for Traffic.com. So I went out to get some coffee. I was surprised to find the hallway filled with people. As I was getting coffee, someone said to me, "What, you didn't want to listen to Collins talk about how great he is?" This was an agency guy. This was someone who could be a client of Traffic.com. Instead of being interested, he now committed the speaker's name and company to memory and filed them under "Irritating." The coffee area was filled with people who had voted with their feet. "Pitch or coffee, I vote coffee" they were saying. I didn't think too much of this since then. But it came roaring back today when I read Jeremiah Owyang's post on moderating conference panels. He has some great advice, most of which my panel's moderator adhered to. This one really irritates the audience, as they’ve spent time and money investing in a panel, they don’t want to hear vendor pitches. Typically, when one vendor talks about how great his company is, the next panelists will need to one-up, and it never ends. The moderator needs to pre-warn panelists that won’t tolerate this vile deed, and will cut them off in public, and that’s embarrassing for everyone. BTW: If you’re in the audience and you see this happen, you have a right as a customer to demand them to stop. Owyang is right, there is a thin line between pitch and telling a story. But everyone at the TRB conference could tell the difference. There were many case studies told and discussed. No one confused them for a pitch. There was a sniff test and it was apparent. The line may be thin, but it is malodorous. For conference attendees, when you are speaking it's hard to tell what your impact is - even if people don't say anything. However, it is screamingly obvious something is wrong if half the room gets up and leaves. Don't sit still for people wasting your time with a pitch. Either way, please do go, read, and bookmark Jeremiah's post. It is clear and concise. it is also easy to pass on to other panel members with a simple URL. 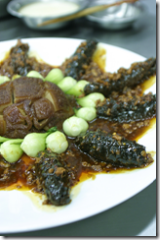 On Sunday I leave for about three weeks in China. I'm going for a conference and a tour of transportation technology facilities and an added seminar, but I'm really going for the food (of course). I'll try to blog as often as I can. Unfortunately, I'm fighting a cold at the moment as well, so it's going to be an interesting flight over. If you are in any of these cities when I am, let me know! 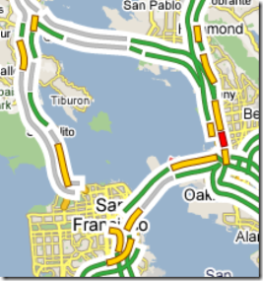 Google has traffic! Their mobile app is so nice, so this should be excellent! There's nothing worse than getting stuck in traffic when you have some place to go, so I'm happy to tell you about a new feature on Google Maps that can help. For more than 30 major U.S. cities, you can now see up-to-date traffic conditions to help you plan your schedule and route. 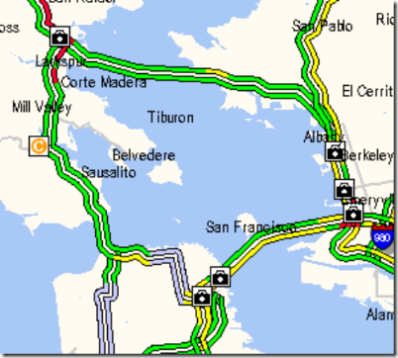 If you're in San Francisco, New York , Chicago, Dallas, or any of the other cities we now include, just click on the traffic button to show current traffic speeds directly on the map. If your route shows red, you're looking at a stop-and-go commute; yellow, you could be a little late for dinner; green, you've got smooth sailing. 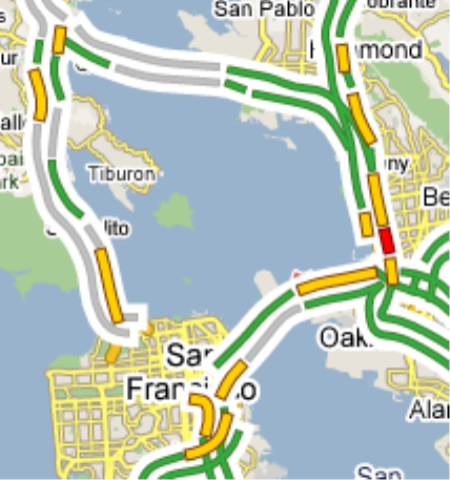 We can't make traffic go away, but we hope Google Maps traffic info helps you avoid it whenever possible. Well, their map is ... pretty nasty. Let's compare the map they have with the map developed by my company, Gray Hill Solutions for the regional government in the Bay Area (traffic.511.org). I appreciate what Google is trying to do with the bigger lines and outlines, but when they lines shoot off in funny directions and go outside their outlines, one is forced to wonder about quality control. Also, we considered laying it over a detailed map like Google did, but when your freeway visualization doesn't reflect the actual roadways, it becomes misleading. So, my bias acknowledged, I have to give the design award to Bay Area real time traffic to Gray Hill Solutions. Blogged at Village Pub in the Magnolia Neighborhood of Seattle. You Can't Hande the GIS-Based Truth! I work with GIS every day. I talk to people about how when you give information a spatial component, the mind treats it differently. It interprets it in a geospatial context. Everything we do is relative to something and mostly everything we do exists in time and space. Therefore, when we interpret information in conjunction with time and space we can have some powerful interpretations. Too powerful, perhaps, for the Seattle Fire Department. John Eberly had a post here talking about just that. Now the post is gone. Here's the slashdotting of that post and here's the Seattle PI article. For those of us who make their living off the marrying of complex information and mapping, this is sort of a watershed event. What happened is this, the Seattle Fire Department used to have a near-real-time feed of calls made to the department. John Eberly took this feed and made a Googlemap mashup. Then, the SFD (or someone) decided that this was too much information and made the once near-real-time data feed into a jpg image. So what we see here is the acknowledgement that non-map-based information is much harder for humans to process. That information provided as a list is benign, but information provided as a map is malignant. Fire officials worry that visually displaying where fire crews are on an Internet map jeopardizes firefighters' safety and could make things easier if terrorists were planning an attack, Fire Department spokeswoman Helen Fitzpatrick said. "That's where the security issue comes in because it shows where all our resources are at one time on a map," Fitzpatrick said. As an aside, if I were advising the seattle emergency community, I'd say take all real-time data off the site and provide only data up to 24 hours ago. John says that his map helps people plan their trips around emergencies - but there are different ways to do that. The Seattle Police Department and WSDOT provide information where incidents are blocking traffic that do not include information regarding the current locations of all police and fire personnel. I also find it highly unlikely that anyone would plan any trip and consult this web site first. Yes, maps are very powerful and seeing the map probably put the fear into the Emergency Services Community - but I am telling you, I can create a bot that can read your jpg and then map that. The information drives the map. Killing the feed and keeping the information is not serving your purpose. To the GIS community ... surely this is some vindication of the power of GIS, eh? Oh the humanity! In my years of being an ITS (Intelligent Transportation Systems) professional, I have seen a lot. I've seen CCTV cameras explode in the hot Texas sun, I have seen red light running cameras with three days' of film go empty in 4 hours in lawless Phoenix, I have seen cities demand that their software be built specifically to thwart the good governance of neighboring cities. So I was not surprised to read of Hoboken's software issues. Bad licensing, bad project management, and a general lack of understanding of components combined to keep New Jerseyans from their parked cars. So, if you ever buy a giant robot parking attendant, make sure you tip it well. Who'll Be My Buzzword Now that my Buzzword is Gone? Okay, I know that's too strong. Marshall Kirkpatrick has a great definition of Web2.0. A good, concise definition with ramifications, goals, and prerequisites. Michael discusses collaboration, rapid site access, and infrastructure improvements, themes I have always included as the cornerstone of Web 2.0. He also discusses the differences between web 1.0 and web 2.0 which are similar to those I discussed in my Oedipal Trajectory of Web 2.0 post a while back. He just does it in less words than I seem to use. I am in this strange space of being a huge proponent of Web 2.0 and totally tired of contstantly having to defend the term "Web 2.0." All these arguments are totally valid. But who cares if they are totally valid? The concepts that are wrapped up in Web 2.0 need a name in order to be easily discussed. My post yesterday posited that Web 2.0 has been so embattled that even great definitions like Michael's don't undo the damage. But Web 2.0 should be about the functionality and not the term itself. Nearly ubiquitous broadband zips data around much of the world in a way that's effortless to users. Data storage is now cheap as dirt. Ingenuity, and the above factors, have led to the coalescence of the last 10 years of programming innovation to a tipping point. These are true, and they divorce the current revolution from the browser. To most people web = browser. Web 2.0 then takes on a browser-centric model which is not necessary. New refrigerators, automobiles and stoves can talk to their homes and get firmware updates and report on status. These aren't browsers - but they are making use of these technologies. As time goes on, intelligent vehicles will be creating mobile peer to peer networks, reporting their locations, speed, trajectory, etc. This type of collaboration is entirely separate from the browser. I would argue that they do represent collaboration and pervasive computing in the spirit of the term Web 2.0, however. There is no Cigar 2.0. Dave Winer attempts to nail Web 2.0's coffin shut with this short essay on why Web 2.0 doesn't exist at all. An epitaph for the non-existent. "Goodbye, yon Web 2.0, we knew yet not; ye existeth not." Web 2.0, like Ajax, is built of tools that predated their term d'arte. This does not mean that the term has no validity. Web 2.0, like Web 1.0, has VC hype. This does not mean that the term is only hype. Web 2.0 has had the stuffing kicked out of it - and that may be its actual killer. Much like Al Gore, Web 2.0 was seen to be all things for all people and when it proved not to be people threw it out in its entirety. Sorta. This is where Winer as a Web 1.0 believer and the Web 2.0 believers find themselves in the same, bewildering camp. Other people have redefined their utopia and they can't put things right. Tim Berners-Lee's vision isn't what the web became. The definition of the web was set by other people than its patron saint. The same has been true for Web 2.0. The definition of web 2.0 has been well documented and canonized by Dion Hinchcliffe, but it can't escape corruption. This is because "Web 2.0" is a open-ended label. It invites the imagination in, which is good, but it doesn't give the imagination a place to go. Software developers will recognize this as wish-list syndrome. Users want the next version of any software to do everything it didn't do in the previous version. There is no expectation management in web 2.0. So Dave Winer is right in saying that Web 2.0 has the same goals as Web 2.0. For Dave Winer. And Dion and Mike Arrington can say it's totally not for them. Web 2.0 has no boundaries and therefore is boundless. The goals of Web 2.0 we can agree on, I think, center around collaboration and two-way data transfer. These are largely centered around blogging and Ajax - the components of which are not novel. What is novel is that we've developed an expectation as a community that the web is more than a huge set of static pages. Yes, Dave, I know that was always the vision - now it's the expectation. Whether we call it Web 2.0 or a Cigar, that expectation is powerful and it's helping along the evolution in business and culture that TBL began. Cyberspace is dead! Long live Cyberspace! Checking in from ITS America 2006. The show seems smaller this year, though I can't prove this. It just seems that way. Maybe it's after ITS World Congress last summer in San Francisco. Flew out here on a delayed red-eye and ended up arriving as the conference was starting. After 15 or so mins of sleep, I came in and set up the booth. In the end, I was up for about 36 hours. I also left my camera at home, having removed it from my bag to meet some friends, but then ended up not taking any pictures. So you'll never see the splendor or magesty that only an Intelligent Transportation Conference can engender. ITS World Congress is where you get a real peek into upcoming products. 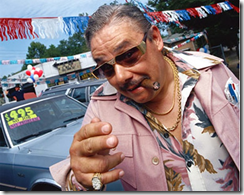 ITS America is more of a schmooze fest. So more business probably gets done here - but there's less to blog about. As usual, Gray Hill is teamed up in the ESRI booth. This is all (for you reading this in the blog and not via the feed) why when you look down to the right a bit, you'll see me in Philadelphia.